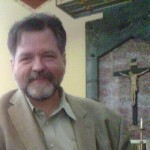 Plainchant studies under Michael Ferry and Robert B. Hill, also Scott Turkington and Theodore Marier. 23 years of experience in information technology in research and academic environments: Unix system administration, web applications development, technical support. Bachelor of Music, 2015, University of Massachusetts Lowell, Music Performance (vocal). Student of Mark Andrew Cleveland (2010-2015). Previously: Robert Gartside, Johannah Segarich, and Susan Dill. The first internet site (1998) with documents on the controversial Medjugorje affair; I still write occasionally on the issue, on the skeptical side of the case.